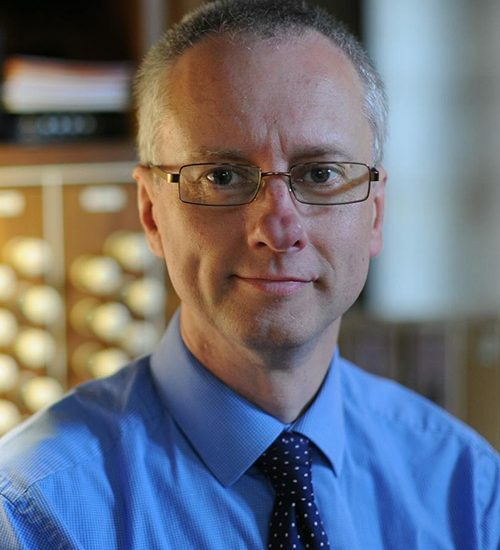 Carleton Etherington is Organist and Director of Music at Tewkesbury Abbey, where his duties include directing the Abbey Choir and accompanying Schola Cantorum. Educated at Chetham’s School of Music, Manchester and London’s Royal Academy of Music – studying with Peter Hurford and David Sanger – Carleton held posts at St Bride’s, Fleet Street and Leeds Parish Church before moving to Gloucestershire. A graduate of London University and a holder of the Academy’s Recital Diploma he was subsequently awarded Associateship of the Academy. He was recently bestowed with an Honorary Fellowship from the Guild of Church Musicians. First prize winner in two prestigious organ playing competitions – Paisley (1992) and the RCO Performer of the Year (1993) – Carleton has performed throughout the UK and in France, Germany, Holland, Belgium, Australia and the USA. His various CD recordings, both as soloist and accompanist, have received widespread critical acclaim. Carleton is Conductor of Pershore and Cirencester choral societies and Organ Tutor at Dean Close School, Cheltenham. He is also the Director of Musica Deo Sacra, a festival celebrating music in the liturgy, which takes place at Tewkesbury each summer.